At Spring Back Northwest in Tacoma, mattresses are deconstructed and components are recycled, a labor-intensive business. The tiny company had to compete with Correctional Industries, the nation’s fourth-largest prison labor program. 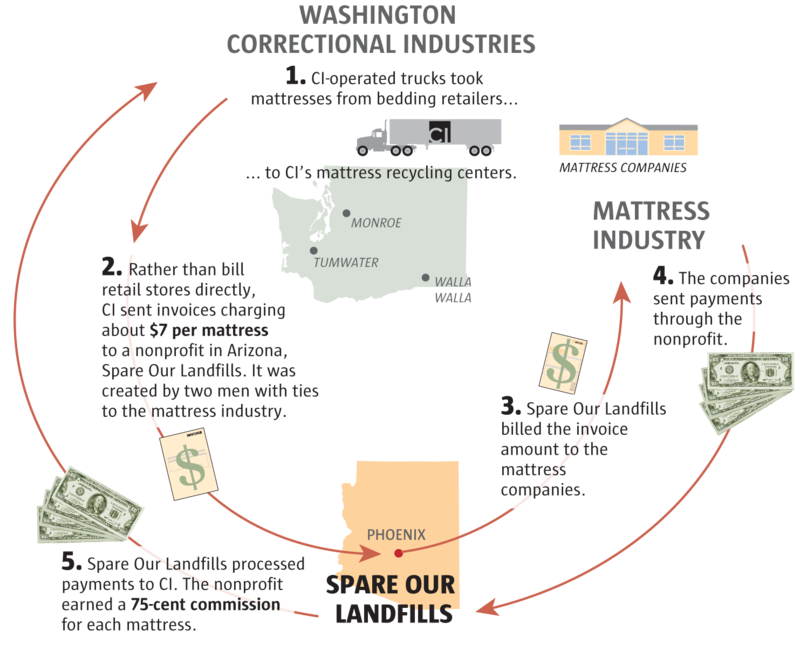 Correctional Industries tried to dominate mattress recycling by using cheap inmate labor and hiring an obscure Arizona nonprofit as a money middleman. 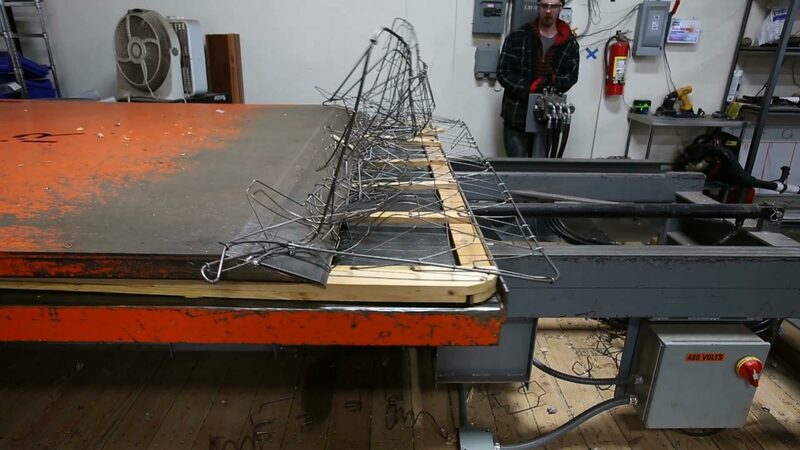 Those tactics hurt a local company that puts hard-to-employ people to work. 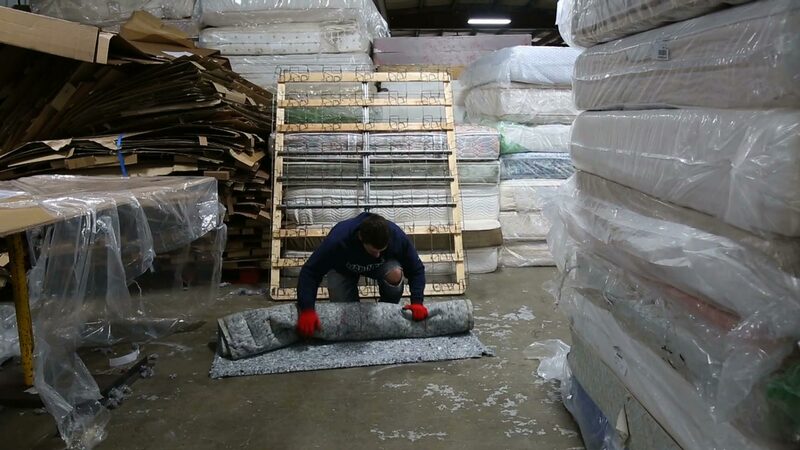 In a ramshackle warehouse off a Tacoma parking lot is a fledgling company that recycles mattresses with workers who would likely have a hard time finding jobs anywhere else. Spring Back Northwest hires recovering addicts and the disabled, former inmates and those just down on their luck. It’s the sort of small-business success story that lawmakers have tried to kick-start for decades. It’s also a company that Washington Correctional Industries (CI), one of the nation’s largest inmate-labor programs, nearly drove out of business. Five years ago, the state-run CI launched its own mattress-recycling operation, taking in used mattresses for a fee and then selling their recyclable components. CI promised not to cost tax dollars nor harm private businesses like Spring Back. Instead, the CI mattress program lost at least $1 million while squeezing out competitors by offering cheap inmate labor to mattress retailers in Seattle and statewide, a Seattle Times investigation has found. By law, CI is not allowed to sell the services of inmates to benefit private companies. But CI officials paid a newly formed Arizona nonprofit, based at the home of a former Washington mattress executive, to serve as their money middleman. Later, on CI’s behalf, a staffer at the nonprofit targeted Spring Back Northwest, trying to poach its largest retail customer, state records show. CI’s cutthroat tactics were part of a costly pattern of mismanagement. In an effort to corner the market, an analysis of state records shows, CI workers in one case drove 446 miles to deliver a small truckload of used mattresses. The state Department of Corrections opened an investigation last month into the recycling program following questions by The Times. The newspaper began examining the program in January. CI shuttered it in late July. Danielle Armbruster, who became CI director in May, said she was unaware that the Arizona nonprofit, which CI paid at least $120,000, had strong ties to the bedding industry. The CI supervisor who oversaw the prison mattress-recycling program now works for that nonprofit group, The Times found. 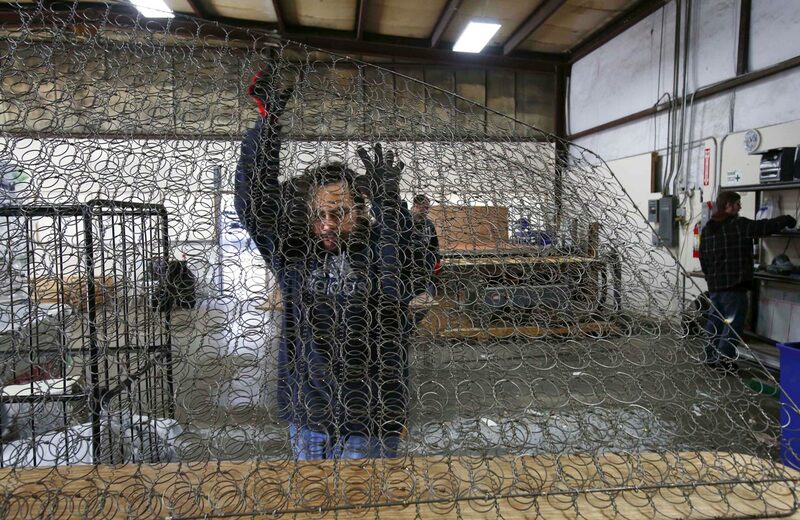 At Spring Back Northwest in Tacoma, workers remove mattress springs from wooden frames. The mattress industry had a problem. Correctional Industries had a different problem. The program provided jobs for only 1,500 inmates — far lower than goals set by lawmakers. CI had difficulty finding new prison-based industries that could generate jobs and profits. Four years ago, the two groups banded together for a shared solution. Mattress retailers could get rid of thousands of used-mattress trade-ins to the prison system which, in turn, could employ dozens of inmates to take them apart and recycle or sell the components. The state’s plan was simple: CI would park empty trucks at big retail mattress companies throughout the Seattle area and statewide. Once the trucks were full, CI civilians would drive to a prison recycling center in Monroe, Tumwater or Walla Walla, where inmates would do the work. State law prohibits CI from selling the services of inmates to private companies, such as bedding retailers. The law is designed to prevent companies from gaining an unfair advantage over competitors. But nonprofit groups are exempt from the restriction. In June 2010, CI launched its mattress-recycling business, issuing a news release noting its partnership with a newly formed nonprofit, “Save Our Landfills.” No other details were provided. The CI news release misidentified their new nonprofit partner. The group was actually named Spare Our Landfills, which had been incorporated just two weeks earlier out of an Arizona suburban home by two men, both former Washington residents who were successful mattress-industry executives, The Times found. Joseph Paviglianti, a former president and chief executive officer of retail chain Sleep Country USA in Washington, works as a vice president for Mattress Firm in Houston. Daryl Newton, who worked for Simmons Co. as a territory manager in Washington, founded a chain of mattress stores in Arizona, where he also works as a business consultant. State law prohibits Washington Correctional Industries (CI) from selling services that directly benefit private industry. A small nonprofit in Arizona was used as a middleman between CI and mattress companies. Note: CI shuttered the recycling program in July after The Seattle Times began looking into it. Retail stores agreed to pay CI about $7 to recycle each mattress or box spring. By comparison, dropping off a mattress at a county landfill could cost $20, which does not factor in transportation costs. The CI deal represented a financial bonanza for retailers. Sleep Country became the first customer. A company spokeswoman said Spare Our Landfills pitched the deal and Sleep Country readily accepted. Spare Our Landfills operated as a middleman between the Washington prison system and private bedding retailers. CI officials funneled invoices through the nonprofit group, which then billed mattress retailers for CI’s recycling fee. Retailers sent payments through the nonprofit group, which forwarded them back to the CI program. 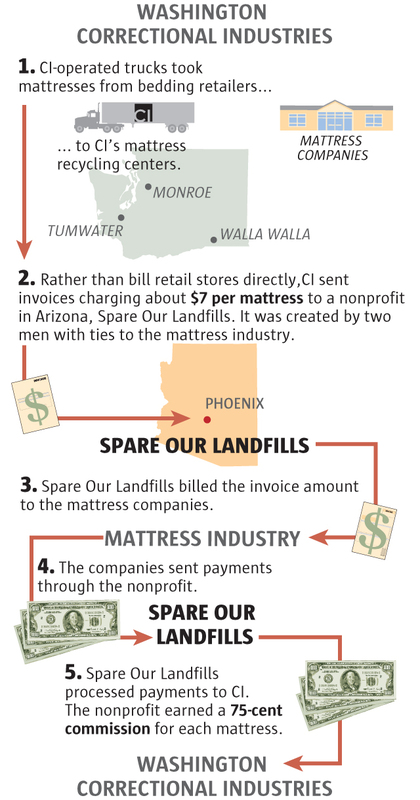 In return, CI officials paid the Arizona nonprofit a “service fee” of 75 cents for every recycled mattress — more than $120,000 overall. The convoluted arrangement made it appear that the state was receiving payments from a nonprofit group rather than mattress companies and others. But this workaround crumbled over time, state records show. Mattress-company managers sometimes contacted CI officials directly to arrange quick pickups of used mattresses. They did not go through the nonprofit. In one case, hotel officials called CI for a pickup of several dozen mattresses after a remodeling project. Despite many customers, state records show, CI lost money from its very first mattress yet was allowed to continue operations for another four years. CI is required to meet with a 13-member advisory board, composed of legislators, industry leaders and public members. The board, largely appointed by prison officials, is supposed to serve as an independent check and balance of CI operations. Rep. Mary Helen Roberts, D-Edmonds, who attended quarterly meetings this year, said those sessions were little more than prison tours, presentations and free lunch. Currently, seven of the 13 advisory positions are vacant. In Tacoma, Spring Back Northwest opened in August 2013 with five full-time employees and a supervisor, Jeremy Simler, a former Seattle mortgage broker who wanted to do something more meaningful. Mattress recycling is a dirty, time-intensive job. It seemed like a perfect match for a small nonprofit with a mission to provide jobs to disenfranchised people and help divert bulky mattresses from landfills. 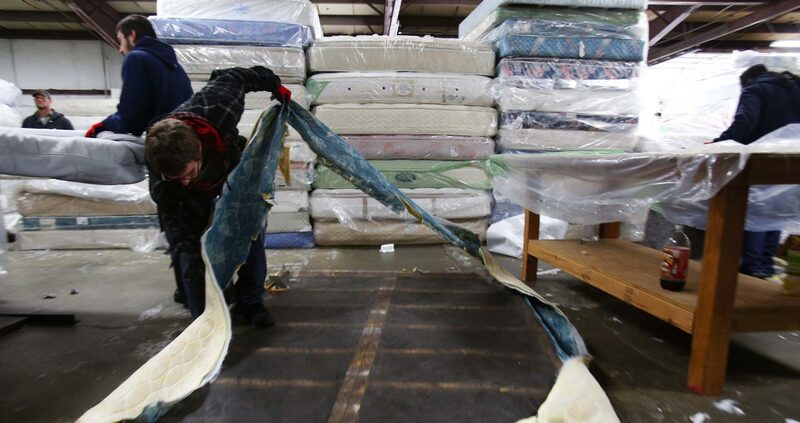 It’s dirty work taking apart mattresses at Spring Back Northwest, which gives jobs to hard-to-employ people, including ex-convicts, and keeps bulky materials out of landfills. The concept for Spring Back was developed through a student competition at Texas Christian University. Today, five nonprofit recycling centers operate nationally. From the start, Simler said, it was clear that CI sought to monopolize the recycling market by charging “ridiculously low” fees. Meanwhile, the CI program, working through Spare Our Landfills, charged retailers just $7 — including pickup. That same month, unbeknown to Simler, a representative from Spare Our Landfills was poised to steal away one of Spring Back’s largest customers, state email records obtained by The Times show. Mattress Depot, a local bedding retailer, had been dropping off mattresses at Spring Back, wrote Gene Shirley of Spare Our Landfills to a CI manager in a Feb. 19 email. Perhaps the retailer could be persuaded to drop off mattresses at CI’s Tumwater recycling center, wrote Shirley, who noted that he had met with a manager from the retailer. Despite a legislative mandate to not harm private businesses, Shirley’s plan to lure away Spring Back’s largest customer met no resistance from CI officials who had been scrambling to boost revenue with more recycled mattresses, state email records show. 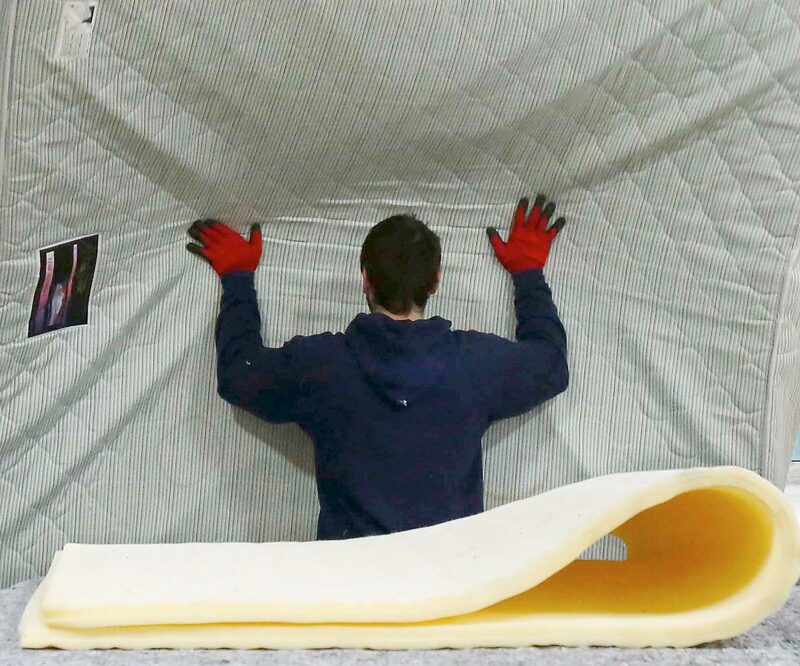 At Spring Back Northwest, workers recycle mattresses by removing foam. CI officials touted the success of the recycling program, which purportedly diverted 175,000 mattresses from landfills. But in private emails, CI officials struggled to find enough mattresses to recycle and recounted costly decisions that had diminished their bottom line. Inmate workforces were idled many days because there weren’t enough mattresses to recycle, records show. In some cases, the Monroe and Tumwater prison recycling centers competed with each other over who would get the next truckload. Transportation costs were among the biggest challenges for CI. In January, for instance, a CI truck picked up dozens of used mattresses in Spokane and drove 180 miles to the Washington State Penitentiary in Walla Walla. But nobody had told the civilian driver that the recycling program there had been closed down. The driver was then dispatched to Monroe, another 266 miles, or total trip of 446 miles. The cost of diesel fuel alone exceeded recycling revenue, state records show. Long trips were normal as CI routinely paid full transportation costs for half-filled trucks in dozens of trips from Renton to Tumwater. Other times, CI couldn’t handle the sudden surge in used mattresses that poured in during seasonal retail sales. One exasperated manager from Sleep Country USA wrote to CI officials in December 2012 and complained that there were too many mattresses and too few CI trucks. CI’s problems did not go unnoticed by everyone at the Department of Corrections. Harry Likin, who helped oversee finances, wrote a series of critical emails in June 2011 that questioned a proposed CI deal with Sleep Country USA. The mattress-recycling manager, Tom Williamson, had floated a plan to pay Sleep Country a portion of profits made by CI when selling recycled materials, like steel and cotton, to commercial vendors. In exchange, Sleep Country would guarantee more mattresses to the CI program, state records show. Under Williamson’s proposal, the CI program would return 25 percent of its profit from recycled products to Sleep Country, which was where Paviglianti, co-founder of Spare Our Landfills, had worked for five years until 2007. Likin expressed surprise that CI, which was losing money, would offer to give away profits to Sleep Country. He noted that Sleep Country already enjoyed a steep discount on recycling, charged as low as $6.25 to offload a mattress, compared with a $20 landfill fee. “I have personally never heard of giving a customer who is already saving money part of your revenue just to do business. State records do not show that the deal was completed. Likin declined to comment. CI officials said that Williamson retired in late 2013 after his job title was downgraded to a lower pay rank. He told The Times that he had grown disenchanted with the future plans of the CI program, but he declined to elaborate. 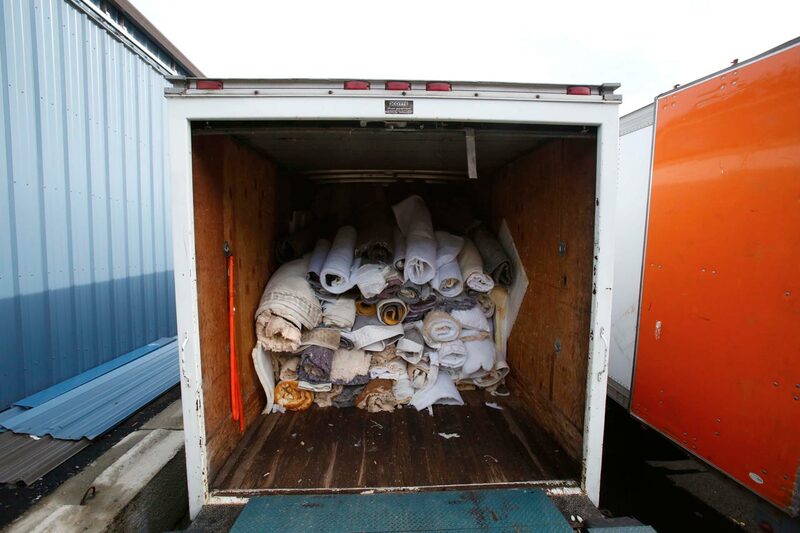 Fabric covers from old mattresses are loaded into a trailer at Spring Back Northwest in Tacoma for recycling. Business has boomed since CI shut down its mattress program. The telephone call came on the business line at Spring Back Northwest in late June this year. The caller was a CI official, said Simler, who reported that the prison recycling program had been closed down. No explanation was given. The irony, Simler says, is that Spring Back is one of the few places that welcome workers with troubled pasts. There are now 11 employees at Spring Back, more than double from the beginning of the year, representing a cross-section of people who are most in need of steady jobs. That includes four recently released felons.